← LONDON 3: The Curious Incident of the Dog in the Night-time, Much Ado About Nothing, and One Man Two Guvnors! It’s Ibsen, of course, and one of my favorites: in my opinion a very difficult play to do for modern audiences, dealing as it does with the sins of the father and a very unscientific venereal disease without a name. But this was at the Almeida, one of the best and most influential little (325 seats) theatres in London. There, a few years back, Joan and I had seen a brilliant version of Ibsen’s Hedda Gabler, both translated and directed by Richard Eyre, another (past) Artistic Director of the National Theatre. He’s done both again for this production, beautifully translated into the modern idiom. Joan, and friends who accompanied us, felt the ending was a little hyper-emotional, and that fewer tears and more anger from Mrs. Alving might have produced a stronger climax. In retrospect, I agree. Still, a great performance of a great play about “lifeless old beliefs” and “dead ideas” and the harm they do. Ghosts! A political thriller by 29-year old British playwright, Lucy Kirkwood. It’s another Almeida production, now transferred to the West End, not to be missed, and I hope it will be slated for an eventual move to New York. It’s loosely structured on a hypothetical search for the identity and whereabouts of the unknown man with the shopping bag who walked bravely in front of the tanks during the 1989 massacre at Tiananmen Square. His identity remains unknown, but Time Magazine once numbered him among the “100 most important People of the Century.” It took Kirkwood six years to invent and develop the play, whose plot and cast of characters are a complete fabrication, a brilliant exercise of the imagination. 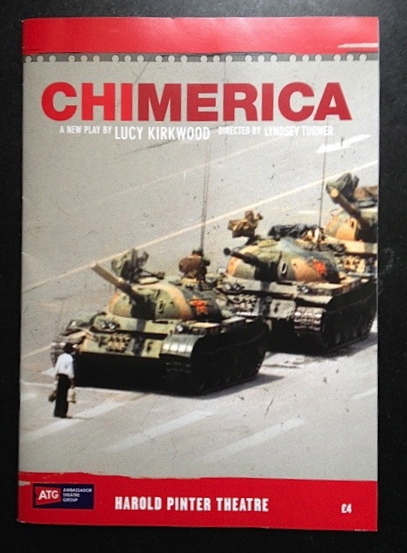 “Chimerica,” by the way, is a word previously coined to describe the modern Chinese-American economic relationship, and specifically how China’s attention to saving and America’s penchant for spending have led us to the edge of global financial melt-down. But it’s also hard to ignore the allusion to a Chimera, the mythological Greek monster: part lion, part snake, and part goat. One last note on Chimerica, the production: Es Devlin’s set design was a powerful and unforgettable display of lasers and images projected on a huge rotating cube, with sliding panels revealing minimal set pieces… wonderfully effective, like passing thoughts. Clearly, lasers and projections are here to stay. A good friend of mine suggested that Michael Grandage might be the world’s greatest working director, so I wasn’t about to miss this one. For years Grandage had been Artistic Director of the Donmar Warehouse, where he had directed both Red and Frost/Nixon, both of which I got to see in New York. 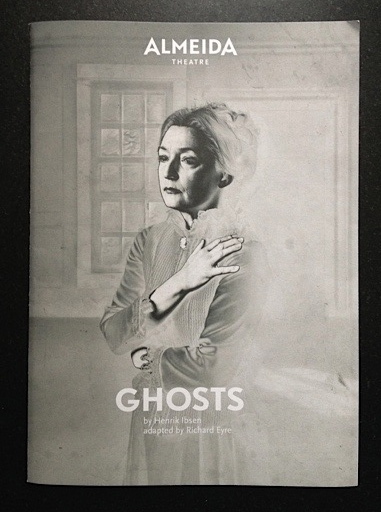 This one is the fourth in a full season of five plays by the Michael Grandage Company at the Noel Coward Theatre [The others are Privates on Parade (w/ Simon Russell Beale), Peter and Alice (w/ Judi Dench), Cripple of Inishmaan (w/ Daniel Radcliffe), and Henry V (w/ Jude Law): pretty damned impressive!] A lot of people have messed around with wild different concepts in producing AMSN, and I can’t say that Grandage’s choices for this one were particularly awe-inspiring. The woodland fairies became a band of pot-smoking hippies, and the setting, in an overgrown abandoned mansion, was their dark playground. There were obvious parallels drawn to the Burning Man Festival, an annual week-long “radical experiment in self-expression” celebrated out in Nevada’s Black Rock Desert, which this past summer drew a crowd of 61,000 celebrants of the weird and magical. This approach to AMSN could certainly be justified, but amidst all that noise and contemporary music, rock and otherwise, I found myself longing for bird songs and clean-shaven little people. But maybe that’s because, as some might say (not me), I’m past the age for true appreciation of such things. So those were the six plays: Two Almeida productions, two National Theatre productions, and one each from the Old Vic and the Michael Grandage Company. But I can’t leave the London theatre scene alone without paying special reverence to the theatres themselves. Impressively, all of them publicly express their commitment to youth and to education. They tour. They open their doors to workshops, school groups, and courses in acting, design, and production. The result, of course, is not only to assure better productions in the future, but better, more alert audiences. In addition to our visits to the Almeida and the Old Vic, this trip didn’t give us the opportunity to get to Shakespeare’s Globe, the National Theatre, or the Donmar Warehouse, all referenced above, or to another old favorite, the Royal Court. I would never go to London without checking all those listings first. And of course, anything by the Royal Shakespeare Company, whether in Stratford or London! But, you can’t do it all, damn it, and we were both ready for home. … Ahah! Sounds like another trip in the works? But first … recovery! 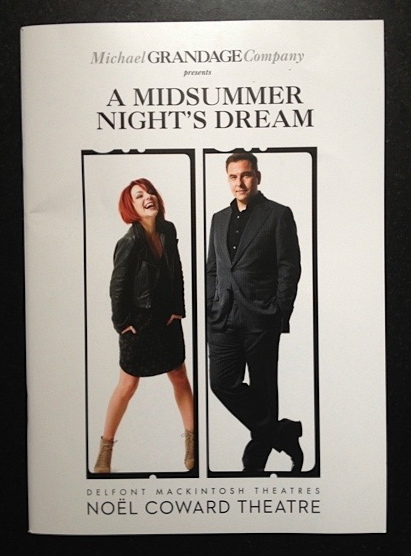 This entry was posted in Theatre and tagged A Midsummer Night's Dream, Almeida Theatre, chimera, Chimerica, Cripple of Inishmaan, Dame Judi Dench, Daniel Radcliffe, Donmar Warehouse, Drama Education, Frost/Nixon, Ghosts, Hedda Gabler, Henrik Ibsen, J. G. Ballard, Jude Law, Lucy Kirkwood, Michael Grandage, Mrs. Alving, National Theatre, Peter and Alice, Privates on Parade, Red, Richard Eyre, Royal Court Theatre, Royal Shakespeare Company, Shakespeare's The Globe, Simon Russell Beale, The Burning Man Festival, the power of imagination, The Tank Man, Tiananmen Square. Bookmark the permalink.